How Long Does An Attunement Take? How long does an attunement take to receive? The time it takes for each attunement will depend on the energetic frequencies that you are being attuned to and this often depends on what teaching you are receiving the attunement for. Typically, the attunement is a 15-20 minute process which can be taken anytime of the day or night. The most important thing to remember when taking any attunement is that you be undisturbed and in a peaceful environment so that you can relax and enjoy the energies being received. After your attunement has finished, you will most likely feel very relaxed, so it can be a good idea to take some time for yourself. Perhaps you wish to do something that you enjoy doing. Just allow yourself the freedom to enjoy this time and to enjoy your new vibration. Love Inspiration offers most of its attunements by distance in accordance with divine guidance. This is something which helps us to send these energies to whomever is in need of these and is something that we feel is important for this earth at this time. 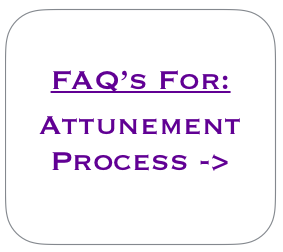 - What is an attunement? - How long does an attunement take to receive? - What should I do during an attunement? ​- What should I do if I fall asleep during my attunement? - What happens after an attunement? - Can I receive an attunement by distance? - Which healing systems require that an attunement be received? - The attunement is a deeply sacred ceremony. Is this true?